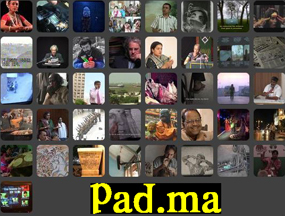 Pad.ma, short for Public Access Digital Media Archive, is an interpretative web-based video archive, which works primarily with footage rather than “finished” films. Pad.ma provides access to material that is easily lost in the editing process as well as in the filmmaking economy, and in changes of scale brought about by digital technology. Unlike YouTube and similar video sites, the focus here is on annotation, cross-linking, downloading and the reuse of video material for research, pedagogy and reference. The entire collection is searchable and viewable online, and is free to download for non- commercial use. For the past two years, Pad.ma has been operating as an online archive of digital video, in essence creating a folksonomy of “tagged” footage. During this period, the focus has been on gathering materials, annotating densely, and growing the archive. At present, Pad.ma has over 400 hours of footage, in over 600 “events”. Almost all of this material is fully transcribed and is often mapped to physical locations. What are some ways to begin thinking about retrieving and utilizing material from Pad.ma? From the onset, pad.ma has had an API (documented at http://wiki.pad.ma/wiki/API), a programming interface that allows a user to access videos, perform searches, seek to exact time-codes, fetch transcripts, and obtain map data, all of which can be shared by any given online user. As such, Pad.ma’s General Public License (PGPL, http://pad.ma/license) is designed specifically for the reuse of the material on Pad.ma. Through the experience of running the archive, there have been various imaginations of multiple and layered forms of time-based annotation over video, including: pedagogical tools for learning and discussion; presentation tools that combine text and video in new ways, along with essays and other writing formats enabled by rich and context-specific media. Download from skype.com if you don’t already have it. In Skype “Add a contact”: basekamp. Send a message when you want to join the chat, by selecting us from your list and clicking ‘Start chat’. We’ll add you to the text chat, and when everyone is ready we’ll start the conference call.